There are several bills before Congress that could potentially have a major impact on veterans’ health care. 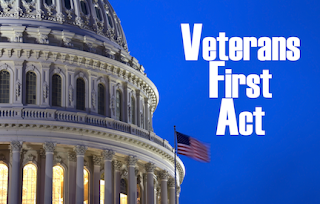 The Senate is currently debating a bill known as the Veterans First Act. This bill includes the expansion of benefits for caregivers of severely injured veterans. Some of these benefits would include more caregiver training, health insurance for caregivers who don’t have their own, guaranteed periods of paid respite time to help battle caregiver burnout, and cash stipends. If passed, this bill will improve a number of the problems currently affecting the existing caregiver program. These proposed expanded benefits would be phased in over time. Within the first year, the VA would focus on fixing the problems with the current system and instituting these new improvements. The next year after that, the VA would expand the program by accepting applications from caregivers for veterans who served in or before the Vietnam War. Then 2 years after that, applications from caregivers of veterans who served between Vietnam and 9/11 would be accepted. In addition to caregiver benefits, the Veterans First Act would make it easier for veterans who served on classified missions to receive mental health care without having to reveal classified information and would improve guidelines for the use of opioid medications to treat various conditions. These enhanced guidelines are aimed at reducing opioid dependence among veterans. 1. VA doctors would NOT be allowed to prescribe medical marijuana, only to discuss its pros and cons with their patients. 2. The VA would not be dispensing medical marijuana. 3. The benefits of medical marijuana are still a hotly debated topic (see our article from last July). The Veterans First Act has not yet passed the Senate. Once it does, it will be sent to the House for discussion and voting. The House recently passed several similar measures which have been sent to the Senate for consideration. Once both houses of Congress have come to agreement on the legislation, it must be sent to the President to be signed into law. As always with Congress, there is no way to know if or when this legislation will be passed. We will keep watch on it and let you know if it becomes law. ThanX for all your information, I'm sure it helps many Veterans. Sadly for many of us (esp with PTSD) all the verbiage in the laws is much too confusing for us to even understand, never mind act upon. In fact even though the VA hospitals & clinics knew I had bad PTSD, no one bothered for about 15 years to even mention to me that it was possible to get compensation. Then after I found out I was faced with so much confusing information. Its all so exhausting with mental health issues. Blessed Be. So glad we could help. It is an incredibly tough system, and so our main purpose is to help vets such as yourself. Hopefully we'll continue to do so.